In 1976 Chef Jon Greenwalt, CEC, AAC came to Reno, NV from Sacramento California. Chef Greenwalt was the American Culinary Federation Western Regional Vice President upon arrival in Reno Chef Greenwalt contacted Chef George Skivofilakas, CEC, AAC of the Bundox restaurant in downtown Reno, Chef Larry Motzner CEC, AAC Executive Chef of Circus Circus Hotel and Casino, Reno and Peter Konig also a local Reno Chef. Chef Greenwalt ask these active Reno Chefs to a meeting in Reno to discuss the American Culinary Federation. Chef Greenwalt explained the benefit of the American Culinary Federation and explained if they could recruit a few more local Chefs they could start a chapter in Reno. The Chefs were very excited and knew they needed to get some powerful and influential chefs interested so they contacted Chef Julius Weiss CEC AAC, Executive Chef Harrah’s Reno. 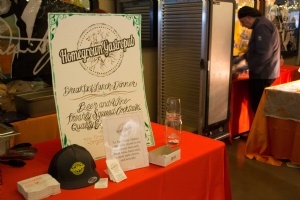 They also knew they need the support from their purveyors and Jay Serrette of the Sausage Factory joined the group. It didn’t take long for the founding Fathers to recruit more chefs and purveyors. With the guidance of Chef Greenwalt the founding fathers decided on a name that would include all Chefs of Northern Nevada they settle on “High Sierra Chefs Association” and applied for charter membership with the American Culinary Federation and the chapter begun. By 1977 the High Sierra Chefs Association became a new chapter in the ACF and one of 11 chapters formed by the ACF Western Regional Vice President Chef Jon Greenwalt, CEC, AAC, HOF. By 1980 membership grew to over 70 chefs and purveyors and by 1983 the chapter had over 100 members. Chef George Skivofilakas, CEC, AAC moved on to become the first Chef Instructor at Truckee Meadows Community College and Chef Julius Weiss, CEC, AAC became the corporate Chef for Harrah’s Hotel and Casino’s. 1979 the chapter open its first office in the Barengo Bldg on East 4th Street and catered the Governors Wolf Pack dinner at the Governor’s Mansion. Under the direction of Chef Weiss in 1981 the chapter held its first food show and competition at Harrah’s Reno. 1981 a future chapter President joined, David Goodwin, CEC, CCE, AAC and 1983 Joe Eidem, CEC, AAC joined to became the youngest Chef to join and holds the record of being chapter president for several terms between 1986 to 2010 followed by Chef Fred Wright, CEC, AAC. New by-laws created for the new chapter, Chapter Charter was resgistered with the State of Nevada. Member recuritement started with in Northern Nevada. American Culinary Federaton offical adds the High Sierra Chefs as a chartered member of the ACF. 1979 Larry Motzner CEC CCE AAC President Peter Konig Vice President This year saw the first Governors Dinner, with food service by HSCA. 800-1000 were served. The first office was in the Barengo Bldg on East 4th St. by Louie’s Basque Corner. It was on the second floor, rent free. This was also the home of Southern Wine and Spirits. 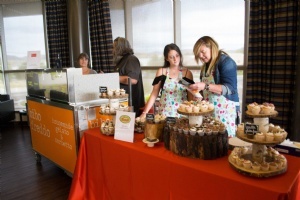 The second food show was held at Caesar’s Tahoe. 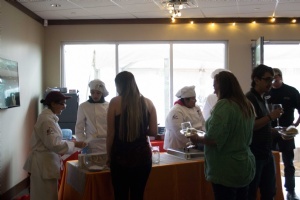 April saw the graduation of the first 10 apprentices from Harrah’s, Julius Weiss AAC Executive Chef. In June the golf tournament was held at Wild Creek. 1983 Peter Konig President Julius Weiss AAC Vice President The third food show was at the Nugget and was approved by the ACF National Office. Chef of the Year Paul Kasper CEPC Culinary Arts Show, the winning grand buffet was by Sahara Tahoe Hotel Casino. Hors d’Oeuvre winning Gold Medal, Michael Hall. Chef Joseph Eidem joins as one of the youngest members. Inga Weiss was doing the newsletter and she never missed a month. Chef of the Year Joseph Eidem CWC. David Goodwin receives his CEC The Forth Food Show was held at Caesar’s Tahoe. In 1984 by action of the ACF national office, apprentices were to be made junior members. The ACF National Convention this year was held at Disney World In Florida. George Skivofilakas says that to be accepted to the apprentice program, candidates must first pass a simple arithmetic exercise and a taste/smell test. This year saw the 1st HSCA family picnic on father’s day at Jack Morvey’s Private Resort. August was the golf tournament at Wild Creek. The ACF awarded Sacramento the 1986 national convention. Italian Swiss Colony zinfandel (2 gold metals) is a bargain at 2.79 a bottle. (3 buck chuck?) The 16th annual Governor’s Dinner in Carson City, with food service by HSCA. guests 850. Octoberfest at Caesar’s Tahoe, with UM Pa Pa band led by Leder Hosen. In December voting took place for Junior Members by-laws to be added to the association. In 1984 there were 37 active western region ACF chapters Chef Joe Eidem takes over newsletter form Inga Weiss. The Presidents Ball was held at the Reno Hilton A new office in Carson City now has a table and bookcase. The newsletter now has an attractive 3-color cover. Western Regional Conference was held in Colorado Springs this year. President Weiss hopes to see our membership top 100 by June. It was 106 in May In May, there was a joint meeting with IFSEA. The Junior Members held their first official meeting at TMCC in April 7th Annual Golf Tournament at Wild Creek in August. $ 45.00 for 2, includes golf, cart and dinner. ACF approved an HSCA Culinary Arts Competition set for October in the convention center. Chef Joe Eidem wins a Bronze Medal in hot food competition. Watch KTVN Channel 2 the week of June 20-24. 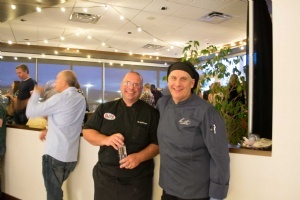 Each night a participating chef will be featured......... those 5 chefs were, Douglas Dale, Joseph Eidem CEC, Joseph Heudorf, Yves Lesquereux and Francois Soyez. 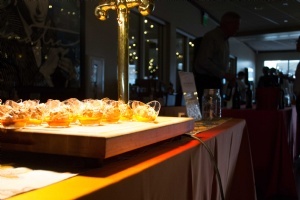 The Annual Golden Garlic Awards of Lake Tahoe was held in June. Joe Eidem was the “Chief Justice of Garlic” for the event. There was an excellent turnout for the HSCA/IFSEA picnic. The 3rd Annual Ross Branch Memorial Golf Tournament was held at Wild Creek Golf Course. Tony’s Salami & Cheese Co. (Tony’s Fine Foods) annual food show was held in Sacramento. At the national convention in Charlotte, NC., Bert Cutino CEC AAC was voted Chef of the Year. The junior members will host the November general meeting at TMCC with a Mexican Buffet. The Presidents Ball was held at the Eldorado. The HSCA/IFSEA picnic will be held at Davis Creek Park, Sunday June 25th. Sam Carducci (Bonanza Casino F/BM) was named Chef of the Year. 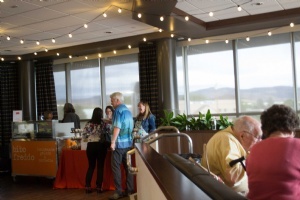 Junior members will host the June meeting at TMCC with a “spring fest dinner”. 4th Annual Ross Branch Memorial Golf Tournament was at Washoe County Golf. 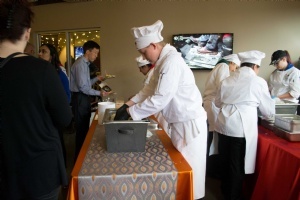 In August, the junior members will host culinary salon prep courses. 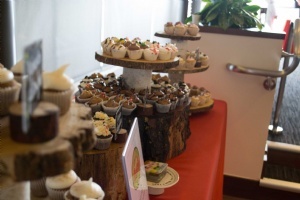 The food show to be held in November at Bally’s, Reno. In August HSCA was named “ACF Chapter of the Year” at the ACF National Convention. 1990 Samuel Carducci President IB Nelleman Vice President The newsletter now has a glossy cover, and a Chef of the Month column with Paul Kasper CEPC AAC profiled. A $5.99 prime rib dinner can be consumed at the Bonanza Casino. The Presidents Ball will be held at the Peppermill. The Wester Regional Conference will be in Sacramento this year in February. 5th Annual Ross Branch Memorial Golf Tournament was at Washoe County Golf. Junior/Apprentice meetings are still being held at TMCC. Paul Kasper CEPC AAC, is writing a certification column. HSCA hosted the Western Regional Conference in February at the Peppermill, with Martin Yan (celebrity chef) giving a seminar for the wives and the public co-host with Joe Eidem and aired on Joe Eidem local TV show “Joseph’s Table”. Joe Eidem and David Goodwin Co-Chaired the conference. The ACF has 5,762 certified members, with 51 CMC and 16 CMPC. HSCA membership is now up to 126, with 30% certified. Glenn Martin has taken on the Apprentice Report column. 7th Annual Ross Branch Memorial Golf Tournament at Washoe County Golf. There are 8 scheduled educational seminars this year. David A. Goodwin CEC AAC, was appointed ACF State Governor for Nevada. Norbert Koblitz CEC was voted Chef of the Year. HSCA membership is now up to 207, with 37% certified. The Octoberfest will be held at Harrah’s Tahoe. Tim Leahy is chapter Chef of the Year. David Goodwin inducted into the American Academy of Chefs Food Harassment and Molestation, doing unnatural/off the wall things to helpless, unsuspecting food. blue potatoes, scallops with sauerkraut, yuk. KIS keep it simple and tasty. The Presidents Ball will be held at the Reno Hilton. HSCA has a new office at 206 S. Division St, Carson City, with Committee Meetings at 5:30 and the Board Meeting at 6:30 HSCA now has 183 members with 37 certified (26%). This year’s Western Regional Conference will be held in Seattle, with the National Conference in San Francisco. 8th Annual Ross Branch Memorial Golf Tournament at Washoe County Golf. The newsletter is up to 20 pages, and has an old president’s column, thanks David. Membership Chairman Ken Kelleher FEELS THAT HSCA could grow to 250-300 members. The First Annual Hot Ice Competition was held at Stateline, Nevada. February Harrah's Tahoe begins ACF Culinary Apprenticeship Program under David Goodwin September saw the Culinary Salon, Edible Cold Food Show. Peppermill hosted the annual Christmas party. Chef of the Year is Anthony Montoya CEC The Junior Chapter was awarded the ’92-’93 Regional Kraft Food Service Excellence Award 1995 Horst Meyer CEC CCE AAC President Samuel Carducci Vice President Tim Leahy Vice President (assumed position last year) Awards dinner to be held at the Reno Hilton. This year New York will host the National Convention. 9th Annual Ross Branch Memorial Golf Tournament this June at Washoe County Golf. Paul Lee CEC, is the Chef of the Year. A newsletter name change from “High Sierra Culinarian” to “Short Order”. Gone also is the glossy paper, now plain paper, 6 pages, and no advertisers. 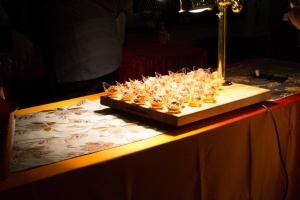 In September the Peppermill will host the “Taste of the Academy”. cancelled HSCA’s First Academy Dinner will still be held at the Peppermill October 11th Hosted by Chef Joe Eidem CEC AAC. 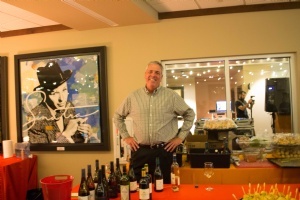 Burt Cutino CEC AAC, chairman of the AAC rated it a success, next year’s event will hosted by chef David Goodwin at Harrah’s Tahoe The Western Regional Conference is in Denver. 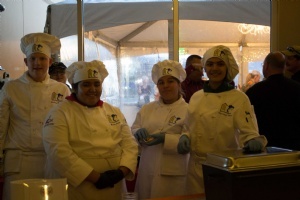 The Junior Hot Food Team brought home a second-place medal out of 8 western teams. Apprentice Wendi Mentink was selected to be in the Regional and National teams going to Berlin this year.Received Presidential Medallion from ACF National President Noel Cullen The Junior/Apprentice will host a fund raiser dinner at Caesar’s Tahoe in May. Chefs will perform at the Sparks farmer’s markets. 10th Annual Ross Branch Memorial Golf Tournament at Washoe County Golf. The golf tournament was well attended with over 100 golfers. The Christmas party will be held at the Great Basin Brewery on Victorian Square. Chef of the Year went to Paul Kasper CEPC AAC. Founding Father George Skivofilikas CEC CCE AAC lost his health battles in October. HSCA is now twenty years old. A big party is planned for this summer at the Peppermill. The Regional Conference will be in Portland this year The Awards Banquet to be hosted by the Eldorado this January. Chef of the Year went to Otto Helfinstein CEC AAC The Washoe County Sheriff’s Office is looking for a jail cook. $28,300 to 37,500 salary Chef Horst Meyer CEC CCE AAC lost his battle with cancer, May 4th this year. 11th Annual Ross Branch Memorial Golf Tournament this September. Did you know that in college Chef (Dr.) Eidem majored in Respiratory Therapy & Emergency Room Medicine? There is a lot more to this chef, actor, medicine man. Christmas party at John Ascuaga’s Nugget. First Nevada Regional Academy of Chefs Dinner, Harrah’s Lake Tahoe, David A. Goodwin CEC AAC, Executive Chef, Chef Joe Eidem, CEC, AAC and Chef Bert Cutino CEC AAC hosts. 14th Annual Golf Tournament will be in June at Washoe County Golf. 2001 David Goodwin CEC AAC President Joseph E. Eidem CEC AAC Vice President The Christmas party will be at John Ascuaga’s Nugget this year. Nationwide there are over 200 chapters. 15th Annual Golf Tournament will be in June at Washoe County Golf. The August picnic was at Rancho San Rafael Park, was hosted by BJ’S Barbeque. Western Regional Chef of the Year is Joe Eidem CEC AAC. The annual Awards Banquet will be held at the Peppermill. This year’s national convention will be in our Nation’s Capital in July. The Western Regional was in Portland, Oregon. 17th Annual Golf Tournament will be June 3th at Washoe County Golf. A joint picnic with IFSEA is planned for July at the Lazy 5 in Sparks. oops canceled. The Family Holiday party is planned for at John Ascuaga’s Nugget. The first gingerbread house competition was hosted by the Chef Norton at the Eldorado. Debora Aragon CCC CCE was named Chef of the Year. Congratulations to Karen Cannan for receiving her CEPC certification. 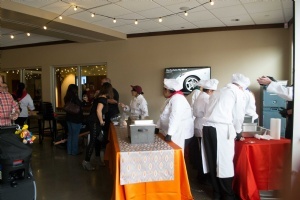 Chef Norton and the Eldorado hosted a 2-day conference, with 2 workshops each day. Carey Krasenky completed her CSC certification this year. Cynthia Kroon was the Pastry Chef of the Year, with Gordon Quong as Chef of the year. 20th Annual Golf Tournament will be at Red Hawk in Spanish Springs. put ‘eat chocolate’ at the top of todays to do list, that way you at least get one thing done. 2007 Michael Norton CEC AAC President Chef Norton and the Eldorado hosted the HSCA’s 30th birthday with a great AAC dinner. 21th Annual Golf Tournament will be at Red Hawk Golf in Sparks. The Western Regional Conference was in Coeur d’ Alene, Idaho this year. Regional Chef Professionalism Award goes to Joe Eidem CEC AAC. Chef Eidem won the National Chef Professionalism Award at the ACF National Convention. 23th Annual Golf Tournament will be at Lakeside Golf in Reno. Chef Michael Norton CEC, AAC received the ACF Presidents Medallion David A. Goodwin CEC AAC appointed National Sargent at Arms. The Christmas party and gingerbread house contest will be at TMCC. It will have hosted by culinary students under the direction Chef Karen Cannan CEPC CCE David A. Goodwin CEC AAC appointed Western Region District Coordinator. And also, received the Antonin Careme Medal for Culinary Achievement. Top Chef registry published, first edition May saw the Top Chefs introduction and gala dinner at the Grand Sierra, with Special Guest Chef Charlie Palmer. Special dignitaries Bert Cutino CEC AAC HOF HBOT and John Minnite CCE AAC HOF HBOT. 24th Annual Golf Tournament will be at Lakeside Golf in Reno. The Christmas party and gingerbread house contest will be at TMCC. It will have hosted by the culinary students under the direction Chef Karen Cannan CEPC CCE. Chef Eidem CEC AAC, left mid-year to take a position as Nutrition Services Manager at the Arrowhead Regional Medical Center in Colton, California. The Talking Stick Resort Casino in Scottsdale, hosted this year’s Western Regional Conference. David A. Goodwin CEC AAC was elected ACF Western Region Vice President. The ACF national conference will be held at The Gaylord Texan near Dallas. Both conferences were informative and tasty. Richard Ernst completed his CPC certification this year. The Christmas party and gingerbread house contest will be at TMCC. It will have hosted by the culinary students under the direction Chef Karen Cannan CEPC CCE. 25th Annual Golf Tournament will be at Lakeside Golf in Reno. January 9th, the Presidents Ball was held at the White Orchid in the Peppermill, Chefs Mark Lund and Steve Kirzman were our hosts, an outstanding evening. Chef Jerry Ignatich of the Grand Sierra was the Chef of the Year, Gina Uzzle Student of the Year and Teri Gilmore was Associate of the Year. March 3rd. We are deeply saddened by the sudden passing of Chef Paul Kasper CEPC AAC and Renowned Culinary Judge. The culinary world will certainly miss this kind and gentle soul. July saw a second Farm to Fork trip at the Lattin Farm in Fallon. Two busloads made the trip. Great Fun In July, the National Conference was held at the Cosmopolitan in Las Vegas, 4 HSCA members attended. Chef David Goodwin CEC AAC was re-elected Western Regional Vice President. January 14th, the Presidents Ball was held at the Atlantis Steak House. Chef Justin Bart is Chef of the Year, and Don Holtzman is Pastry Chef of the Year. Student Chef of the Year was Hoyt Scharff 4th from AACT. The annual board retreat is at AACT on January 20th. Feb. 27. ACF Accreditation Ceremony for AACT. This is the March meeting. AACT First school to achieve this in Nevada! One of only 12 in the Western US. March, the San Francisco ACF Chapter hosted the Western Regional Conference at the Marriott City Center in Oakland California. The Western Region Cutting Edge Award was presented to Joseph Eidem CEC AAC. A new updated website went Live under the direction of chapter President Chef Jay Rathman “ACFHSCA.org”. The new website features chapter history, photo's of past Presidents, upcoming events and photo's of past events, list of current members and much more.